Spiraling IMAX 3D effects in vibrant food colors! Below is a special behind-the-scenes sneak peek of the Sony animated IMAX 3D feature, “Cloudy with a Chance of Meatballs”. 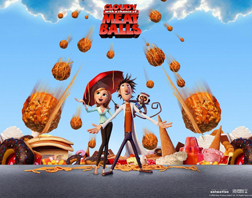 Written by a well-known children’s book author, Judi Barrett, and illustrated by Ron Barrett, the book “Cloudy with a Chance of Meatballs” was developed by Sony Pictures Animation and Sony Pictures Imageworks for three years to re-create it for the big screen in 3-D opening this Friday in IMAX. A small-town inventor who’s known to the locals as the town’s wacko, Flint Lockwood (“Saturday Night Live”s Bill Hader) remedies his town’s stagnant diet of Sardines with his first successful invention. A contraption that turns the sky’s natural precipitation into raining food from the sky. With this invention he instantly is transformed from an outsider, to the town hero, reaching celebrity status, and giving a weather girl intern, Sam Sparks (Anna Faris) her big lucky break. But all the while, Flint is still seeking approval from the person that matters the most, his father, Tim Lockwood (James Caan). Inventor, Flint Lockwood turning rain into food in Cloudy'. Much like the United States recent collapse of the economy, the demand of the town’s residents, far out-ways the fulfillment that Flint’s machine can supply to the ever increasing food orders. Ultimately making a town once looked at and admired around the world (China and London included) as a fruitful place, comes crashing down into a literal spiral disastrous end. The 3-D animated feature takes a closer look at how the town, “Chewandswallow” in the book became the way that it did by giving a back story to the main characters. The two-man team directors and writers, Christopher Miller and Phil Lord took the town name, and gave it an origin of “Swallow Falls”. The town’s mayor, Mayor Shelborune (voiced by Bruce Campbell) is motivated to publicize the commodity of raining food to the world, and changes the name to “Chewandswallow”. “Cloudy With a Chance of Meatballs” begins with an opening credit of “made by a lot of people”. In fact, the movie was made by a crew of 500 people split into departments of animators, actors, and set model makers. Yes, actual mini-sized sets were created for this film. According to Production Designer Justin K. Thompson, and Chief Technology Officer and Visual Effects Supervisor, Rob Bredow, (their first animated feature, “Polar Express”) there was more mini-photography than animation in this movie. They used virtual lights to mimic real-life photography. And, instead of overwhelming audiences with an abundance of 3-D usage, this film does the opposite, and only uses the extreme 3-D effects of objects jumping-out only when needed. The most memorable and impressive scene in the animated feature required the making of 20 lbs of JELLO (you’ll have to see it for yourself!). A lot of real food testing was done to mimic the real life-like movement of food. Hence, many cheeseburgers and hot dogs were thrown from high distances during the making of this movie! Fun characters include: Steve the Monkey, Flint’s sidekick (Neil Patrick Harris); “Baby” Brent, the town’s celebrity “has-been” (Andy Samberg); And most memorable, Earl Devereaux, local law enforcement (Mr. T), and Cal Devereaux, Earl’s son, voiced by Bobb’e J. Thompson. Cameos include Al Roker, and the two directors and writers of the film (one as Flint’s failed invention, a “rat-bird”). After you’ve watched the movie in the theater, you can re-live some of the key scenes over and over again in a specially developed video game for XBOX 360, PlayStation 3, and Wii. The video game was developed by Sony with the use of the real scale models used to make the movie. Video game version was created for children ages 9-12, but anyone can enjoy the obstacles of the film’s food disasters, which by the way, the movies creators were inspired by real disaster movies. As sci-fi fans, they paid homage to “Independence Day”, “Star Wars”, and “Star Trek” by having actual snippets of scenes from those movies in “Cloudy’. And opposite of the book that had limited color, this movie is very vibrant. As described by the animators, “It’s a comedy first, and a disaster movie second”. It was made to be “more silly so audiences really get a sense that none of the characters will really get hurt”.